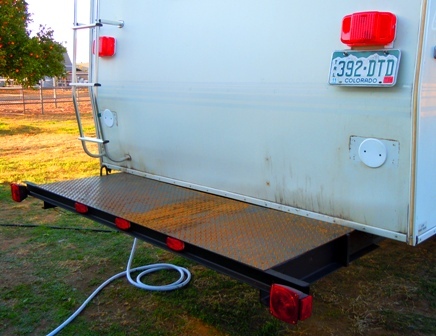 I built this RV cargo deck to help solve the problem of us lookin' like 21st century Clampetts every time we hit the road... Seems like every time we start loading our camp... we end up lookin' like Jed and Granny. 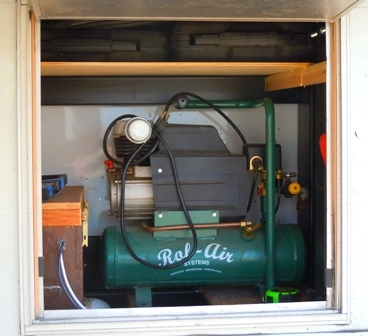 That being... a home for the storage box, generator, chairs, and leveling blocks... among other things, that used to get stuffed in, under and around the hitch and the Roadstar Raider Motorcycle that occupy the truck bed. 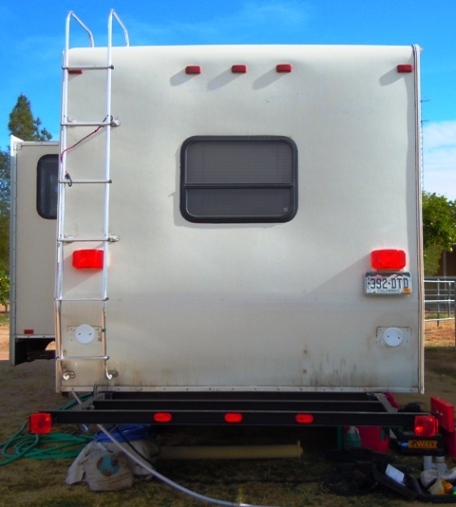 Trying to stuff things into every lil' nook and cranny... in a way that'd leave it available if needed, yet still not blow off when we hit a pot hole on the highway... was a recipe for squabbles... and less than sufficient outside storage space is one of the shortcomings of our Old Jayco. 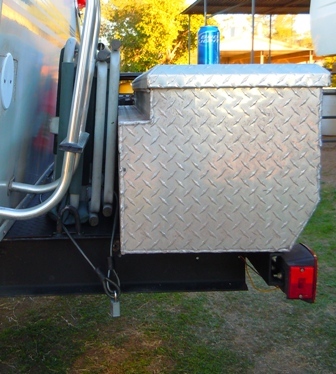 So... with the lil' bike gone... it was time to make the Cowboy II motorcycle carrier gone too... so I could get towork framing in the new RV cargo deck. 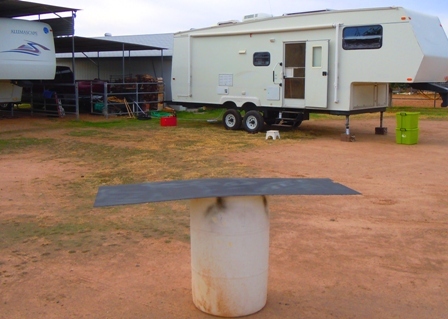 With the framing plotted out and welded in place, we had to run around and find a reasonably priced piece of diamond plate and have it cut to form the decking for the new RV cargo carrier. 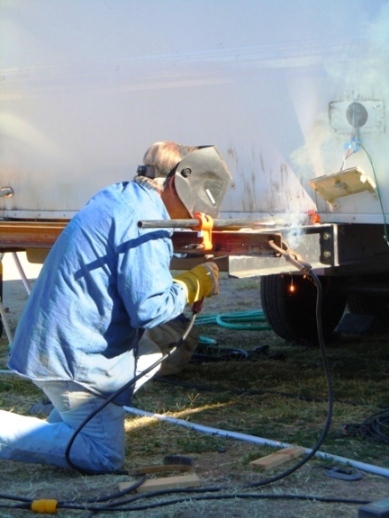 Having left the central Arizona area more than twenty years ago... it was a good thing I had my brother-in-law Bud, to chauffeur me around to the steel shops he knew of... or I'd still be lookin'! 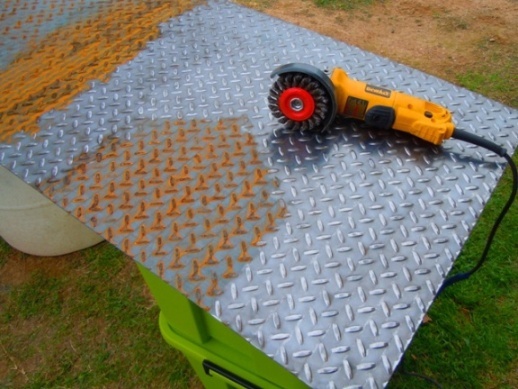 New steel, even in Arizona seems to have a coat of rust on it... so an hour or so was spent with a wire wheel on my grinder... polishing the diamond plate decking... to receive its coat of paint. 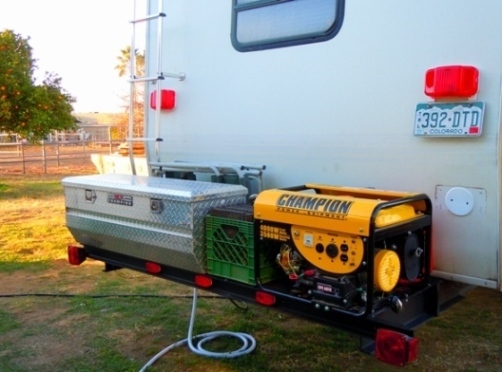 With all the pieces and parts of the RV Cargo Deck welded and painted and riveted in place I set about mounting the aluminum cargo box from the truck, our new champion generator, the leveler pad box... and a few other odds and ends. 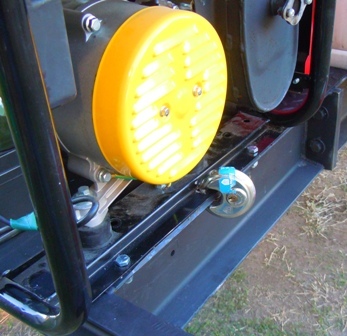 To bolt the cargo box and generator down, I ran bolts through the frame members of the RV cargo deck. I've got no real desire to see sparks zingin' around some dark night... as we roll through the American West... when my generator falls off and goes skiddin' down the highway at 60 miles an hour! As I was rebuilding the tail rack on the Eagle, I also reworked all the tail lights and marker lights. We had a little "incident" hauling through Utah... and I wanted to make gol' durn sure, that anyone running into the back end of my rig... couldn't claim a lack of lights was an excuse. A pair of box covers from Home Depot fit right over those holes... and with a lil' silicone... sealed 'em up to prevent any rain or anything else from seeping into the body. 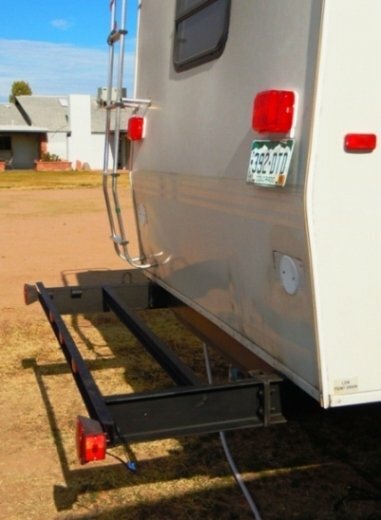 So now, where the Jayco factory installed two tail lights down low... I now have four fully visible tail lights and three new marker lights... added to the five factory markers across the the top. Well... it was a pretty simple job to cut off the old motorcycle carrier, burn in place the cross members, paint and rivet down the decking, and then bolt up everything that was to be mounted back there... I took a lil' care to make sure that I had security cables and locks... so that those tempted by a life of crime... wouldn't have too easy a time absconding with my treasured possessions. 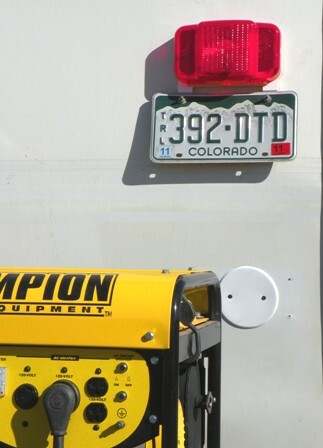 The generator got the most attention, when we mounted it on the RV Cargo Deck. 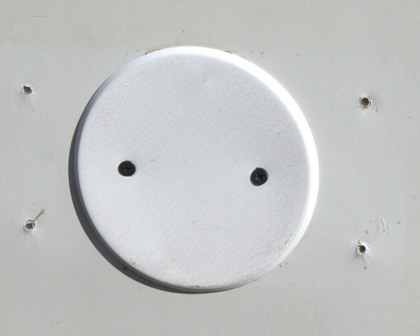 It's bolted down by four bolts, with buggered up threads, which will shut down the smash and grab boys looking for a quick getaway... and then the additional security of a "puck" lock was added through a frame member. 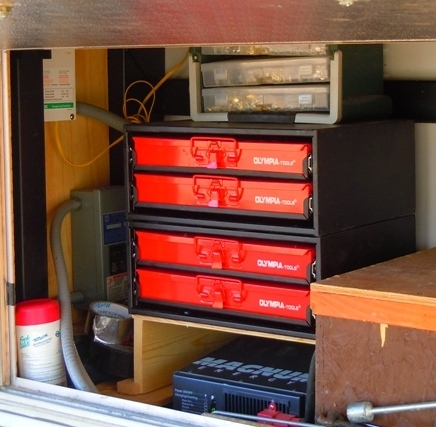 With the increase in efficiency and convenience we gained by adding this RV cargo deck, I was able to open up enough room in the front compartment to install a set of hardware bins, as well as my 3/4 HP compressor... which with the addition of the generator last fall, I now have the power to run... HooYa! So... there you have it... Greatly Improving the storage and accessibility of my camp cargo on our fiver, with the addition of an RV Cargo Deck!